Do It Yourself Foot Scrub Recipe For Spring Sandal Season! We are always looking for tips for staying beautiful after 50 from head to toe! This wonderful do it yourself foot scrub recipe from Michelle Pino, Spa Manager at Skana Spa and Salon at Turning Stone Resort and Casino in Verona NY will help! Let’s face it- winter is hard on our feet. While we’re stuffing them into cute snow boots and lace ups that pinch our toes, our skin is getting dry and gross. When springtime comes around and it’s finally time to put on our favorite sandals, we take one look at our feet and gasp in horror. In an ideal world, the solution to this problem would be a day at the spa, complete with seaweed wraps, mud masks, exfoliation and a massage from a hot Swedish guy named Sven. However, as moms and wives, we all know that finding the time- let alone the money- for that can be challenging. Between taking care of the kids, getting dinner on the table and getting your own work done, full days of self pampering are few and far between. Don’t get disheartened, though! When the evening winds down and the little ones are in bed, there’s an easy way to pamper your tired feet and get them ready for sandal weather with a simple do it yourself foot scrub that has a great citrus scent. The four ingredients are available in two simple stops- your local health food store and the grocery store, places you might be going anyway. Here’s how to make a scrub that will leave your feet begging for more. To make the scrub, simply take a sealed container such as a tiny mason jar and add the sea salt. Gently stir in the grapefruit zest and the grape seed oil, making a mixture. Add the essential oil to your desired scent- I like 10 drops because the citrus smell leaves me feeling refreshed- and allow your scrub to rest for about ten hours in order to allow the ingredients to reach their peak. When your scrub is ready, grab some with your fingers and massage your feet. Focus on your heels and the soles of your feet to get those pesky dry areas, but make sure to get your toes, too. This scrub is a great start to an at-home pedicure, as the grape seed oil softens cuticles and moisturizes skin thoroughly. If you have dry hands, knees or elbows, this scrub can be used there, too- it’s not solely for feet! This do it yourself foot scrub recipe makes one or two uses, but can be doubled to make a larger batch. If making a larger batch, storage in the refrigerator is recommended. When you use this scrub, you will enjoy the antimicrobial and odor eliminating powers of grapefruit essential oil as well as the mineral therapy of sea salt and the moisture of grape seed oil, leaving feet feeling thoroughly pampered. 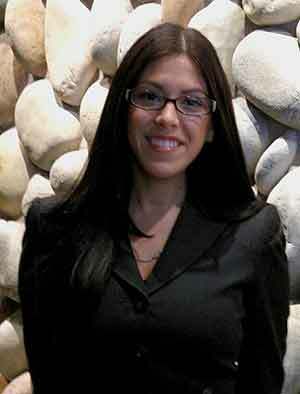 Michelle Pino, is a Spa Manager at Skana, a spa in upstate New York at the Turning Stone Resort and Casino in Verona, NY. She enjoys DIY projects, healthy recipes, exercise, and all things related to skin care. If you have any comments or questions feel free to contact Michelle via email!